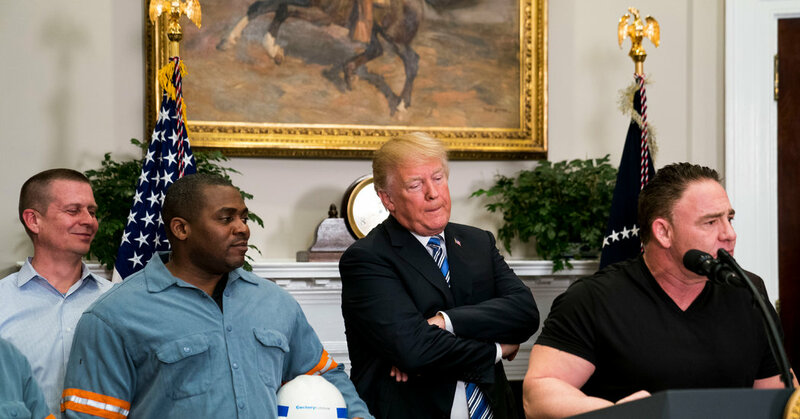 When President Trump signed proclamations to place tariffs on imported steel and aluminum on Thursday, he portrayed it as an effort to throw around America’s economic weight in hope of reaching better deals from major international partners. But Mr. Trump, who had set off warnings by trade experts that this could become the first attack in a global trade war, also sent a different signal. There would be exceptions in the nations that the tariffs are applied to, he said. The result is that the new tariffs look more like a negotiating tactic — less the beginning of a war, more the beginning of a new round of haggling. After announcing last week that the tariffs would apply to imports from all countries, the Trump administration said that they would not apply to Canada or Mexico, pending renegotiation of the North American Free Trade Agreement. These exceptions suggest the administration is looking to use the threat of steel and aluminum tariffs as a cudgel to get a better deal out of those two close allies — which are also major exporters of metals to the United States — in mostly unrelated negotiations to revamp the 25-year-old agreement. The president also said that other countries would be invited to negotiate with U.S. Trade Representative Robert Lighthizer if they wanted to make special deals of their own to avoid the tariffs. This raises the possibility that allies like South Korea and the European Union could avoid the tariffs by making sufficient concessions. That stands in contrast with the legal rationale for the tariffs. Mr. Trump is invoking a section of trade law allowing the president to take action to protect national security. The Trump administration has argued that by subsidizing steel and aluminum production, other countries, particularly China, have undermined domestic metals production in ways that could leave the United States vulnerable in a war. Legalities aside, the fact that President Trump is indicating that the tariffs will be negotiable on a country-by-country basis, rather than set in stone, diminishes the risk that this will be the beginning of an all-out trade war in which the very underpinnings of global commerce are threatened. The mix of bluster and openness to compromise is consistent with a longstanding pattern that was evident in President Trump’s business career. Still, the stakes here are the global economy rather than a real estate deal, which leaves experts in the field unnerved. It is certainly possible for this to spiral into a broader trade conflict that involves higher tariffs on all sorts of goods and services and an unraveling of the trade arrangements built over decades. But the pattern so far in the Trump administration has been one in which the president stakes out a bold, aggressive position, only to compromise as the lawyers and economists in his administration fill in the policy details. That’s in part because the president’s words keep clashing with geopolitical reality. A big problem for the administration is that the countries that export the highest volumes of steel and aluminum to the United States also happen to be some of its closest strategic allies. By getting tough on steel tariffs ostensibly to protect national security, the cost might be alienating some of the nation’s closest military and diplomatic partners. Canada is the largest exporter of the metals to the United States. Another large exporter is South Korea, which plays a key diplomatic role in trying to resolve tensions with North Korea. China is a relatively small exporter of steel and aluminum to the United States. Similarly, as the administration has sought an overhaul of Nafta, its impulse to rip up what the president has called a terrible deal for the United States has been reined in by the realities that American agriculture interests benefit from exports to Mexico. And the United States automobile industry relies on a supply chain that crosses both the Mexican and Canadian borders. That doesn’t mean that the national security-based threats will necessarily lead to a Nafta deal more agreeable to United States interests. Canadian and Mexican negotiators will be reluctant to let the strategy work. If they offered concessions in exchange for avoiding the metals tariffs, they would fear the precedent it would set.